In December of 2014, the Board of the Canadian Anesthesiologists' Society convened to announce two newly appointed Associated Editors of the Canadian Journal of Anesthesia (CJA). Faculty Member and Associate Professor, Dr. Philip Jones, is now the Associate Editor for the CJA, and his appointment commenced January 2015. The CJA is a critical piece of literature in the fields of research and practice in anesthesia. 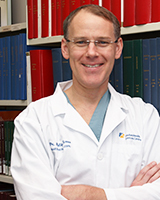 On behalf of the Department of Anesthesia and Perioperative Medicine, we would like to congratulate Dr. Jones on this esteemed appointment. We have no doubt that the CJA will greatly benefit from Dr. Jones' leadership and expertise.